You will fall in love with this boozy coconut banana cake because not only is it exceptionally decadent, but it’s the cake that solves all problems. 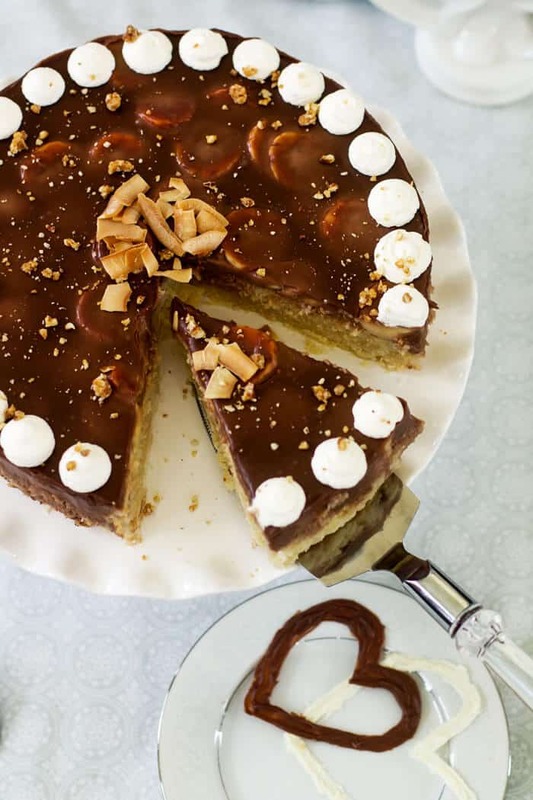 Not overly sweet, this German-style cake yields layers of different textures and it’s unlike any other cake you might get at your Wal-Mart bakery. 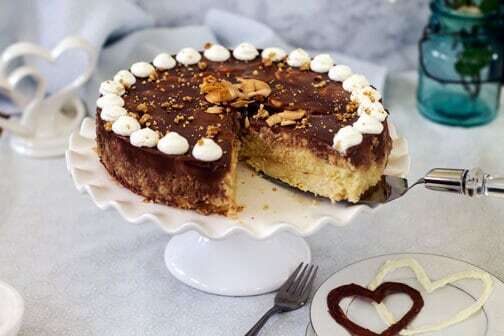 I love German cakes because they’re simple enough yet super delicious, like this Bavarian apple cheesecake and gluten-free strawberry-oatmeal cake. Wouldn’t you want a special cake for Valentine’s Day? Have no date? No worries, I just told you it solves all problems. It is so delicious, you’ll be happy you don’t have to share it with anyone. My husband wasn’t thrilled when I told him that the cake I’m testing for Valentine’s Day is made with coconut. He doesn’t like the gritty coconut texture, he said. But then he ate most of the cake by himself. It’s that good. He wanted you to know. 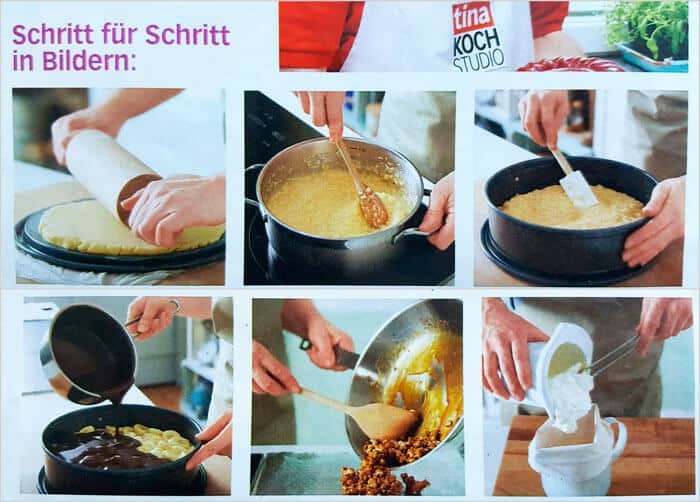 I adapted the recipe from an old German cooking magazine Tina. When I got to the coconut filling section, I was a bit leery that it didn’t call for any butter. Although supple, the filling doesn’t fall apart. 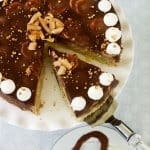 The crust of this yummy cake is like a soft cookie topped with coconut rum filling, covered with creamy banana slices and drizzled with chocolate. Fall.In.Love. Use coconut or almond milk for extra added flavor. For the alcohol-free cake, replace the rum with milk in the filling and with heavy cream in the chocolate topping. In a large mixing bowl, knead together the flour, sugar, egg, salt, and butter until soft dough forms. It should not be sticky. Add more flour if necessary. With a rolling pin, roll the dough out directly on the bottom of a 10-inch springform (enter this giveaway for a chance to win one plus more baking supplies – ends 1/31/18) or press down with your hands. Put back the springform side and secure the latch. Cool in a freezer for 10-15 minutes or in a refrigerator for 30 minutes. Place the springform on a cookie sheet to catch any grease and bake the crust for 15 minutes. Cool on wire rack. In a non-stick pan, mix together the milk, sugar, eggs, and coconut. Simmer over medium-low heat, stirring constantly, until the mixture thickens to polenta or grits-like consistency. Remove from the heat and stir in rum. Let the filling cool, and then pour evenly over the crust. Slice bananas and sprinkle with lemon juice. Layer the banana slices over the filling. Some overlapping is ok. In a small saucepan, heat together the heavy cream and coconut oil. Remove from heat and add chocolate pieces. Let it sit about 5 minutes then whisk until all chocolate has melted. Mix in rum. Let cool until it slightly thickens to ganache-like consistency (otherwise the chocolate is going to run down the sides of the cake). 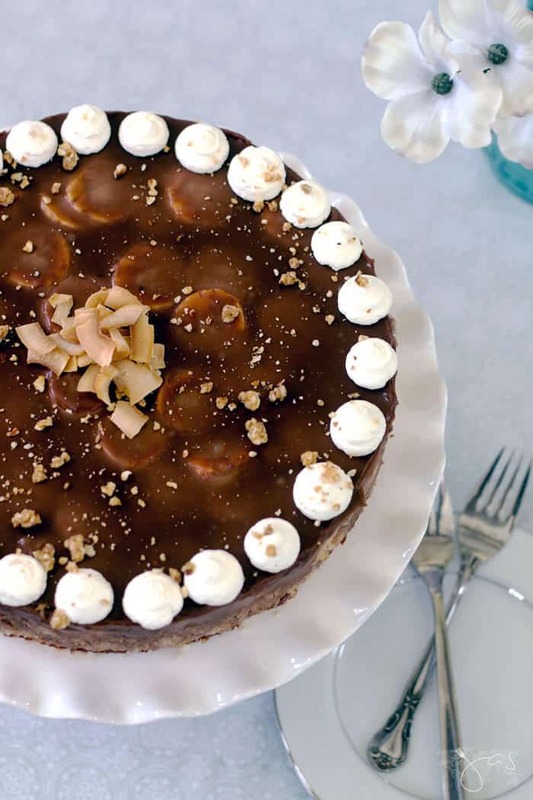 Pour the chocolate over bananas and refrigerate the cake for at least three hours. Garnish with whipped cream and almond brittle if desired. In a small non-stick skillet, heat the sugar until caramelized. Mix in the butter and almonds. Spread on lightly greased aluminum foil to cool. Use leftover brittle to top smoothie bowls, ice creams, or parfaits. 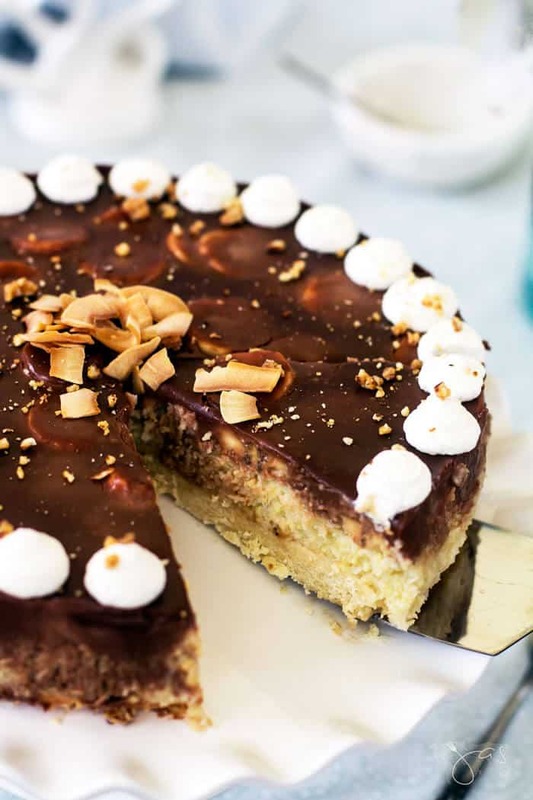 Decadent creamy German cake with coconut, banana, rum, and chocolate is the perfect treat for a special occasion. With a rolling pin, roll the dough out directly on the bottom of a 10-inch springform (enter this giveaway for a chance to win one plus more baking supplies - ends 1/31/18) or press down with your hands. Put back the springform side and secure the latch. Featured on: Fiesta Friday and The Cottage Market. You know you had me at boozy…. You are an amazing baker. I always love every recipe you post. Pinning this one to go along with your hundred other recipes I think are wonderful. I love this combination of flavors! What a delicious cake! And your cakes are always so pretty, too! The flavors are perfect together! Thank you, Beverly! This looks heavenly! I can only imagine how great it tastes by looking at those photos! I pinned this recipe and I hope you make it! Thanks for sharing! This looks decadent and delicious! Thanks for sharing! It looks decadent! Thanks for sharing with SYC. Oh My Word Jas, that looks and sounds so delicious my friend. And as luck would have it we bought some coconuts yesterday. Do you think freshly grated coconut flesh would work or do we need to wait for it to dry out a bit before I beg my daughter to make it for us? I wish my husband liked coconut – this looks and sounds amazing! Thanks for sharing at the What’s for Dinner link up. His loss, Helen. LOL 😉 Thank you for stopping in. You had me at boozy!!!! Thanks for linking up at Friday Frenzy Link Party! Pinned!! I always wanted to make a boozy cake. But boozy and with bananas, sounds amazing. That’s what I said and I wasn’t disappointed, lol. WHAT?!? this thing is off the HOOK! Pinned it!! Thanks for sharing to the Friday Frenzy! Haha, Laura! 😀 I’m thrilled you like it. It was a hit in my house! Your Boozy Coconut Banana Cake will be delicious! Hope you are having a great day and thanks so much for sharing with us at Full Plate Thursday and come back to see us real soon! Yum! i want to make this now. Thanks for joining the To Grandma’s House We Go link party! Hope to see you next week. Looks fantastic! And boozy? Yes please! Thank you for sharing on Merry Monday! Hope to see ya next week! Yes, boozy – the best kind, lol. Thanks, Kim! I love piña coladas so you had resold at boozy coconut! This recipe looks divine. You have such great recipes! Thanks for sharing at Party in Your PJs!